A two storeyed building of rubble. The oldest part is the N. block,1 which is probably mainly of the late 16th century though the E. end was rebuilt late in the 18th; the S. block was added in the 17th century. The N block has a diagonally set chimney with modern capping at the W. end. In the S. wall is a small window lighting the stairway, and the original entrance doorway which now leads to the later extension. The present main entrance is in the E. gable end, which has been rebuilt about 10 ft. short of the original end, still marked by some large stones in the adjacent garden; the date of the rebuilding is indicated by a horizontally sliding sash window of late I8th-century type. Part of the N. wall has also been rebuilt at an uncertain date, but stones remain from the W. jamb of a doorway opposite that surviving in the S. wall. The original doorway in the S. wall is arched, with a heavy frame and a draw-bar slot. There is a wide fireplace in the W. gable end, with a well-built winding stone stair in the S.W corner. The original moulded post-and-panel partitions survive on both floors, but have been moved. The roof-timbers are original .They have never had wind- braces; this and the design of the stone stair suggest a late 16th-century date for this block. 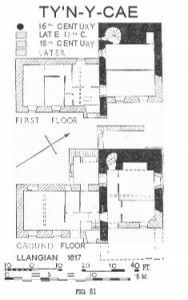 The S. block is entered from the E. A small projection for a stair at its N. end shows in its E. face a straight joint at the original face of the older building. Internally, most of the original moulded post-and-panel partitions remain although later subdivisions have been added. The dog-leg wooden stair in the E. projection (Plate 54) has slat balusters, narrow moulded hand-rail, and finials to the newels. A well-preserved original doorway remains opposite its head .The roof-timbers are inaccessible . There is a cellar below the S.W. half of the block. 1 For convenience in description, the axis is taken as N.-S., though in fact it is near N.N. E .-S . S.W .